Berjaya Times Square Theme Park is located inside of the Berjaya Times Square shopping mall in the Golden Triangle of Kuala Lumpur. It is at the fifth and seventh floor of the mall. 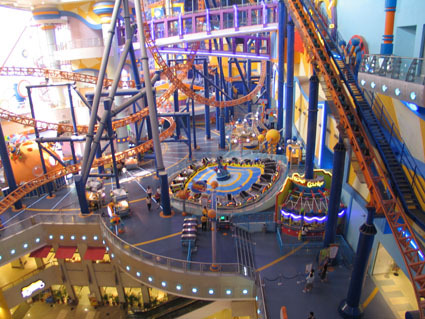 Berjaya Times Square Theme Park is the largest indoor theme park in Malaysia. If you're coming by monorail then your stopping station is "Imbi". Times Square is one of the biggest shopping malls in the country, the Berjaya Times Square Theme Park is located on the fifth floor and is designed for both adults and children with two zones. It�s perfect for those bad weather days, when you can�t explore the city centre, or if you�re in the mood for a hair-raising roller coaster ride in the midst of a shopping spree � after all, it�s bound to be less frightening than all the money you�re spending in the mall. Highlights include thrilling rides such as the Supersonic Odyssey and DNA Mixer. The Galaxy Station is made for adults while Fantasy Garden is decidedly kid-centric. All in all, there are a total of 14 rides and in comparison to other theme parks around the world, it�s easy accessibility and all-weather rides. 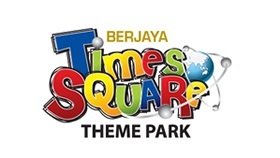 There are four thrill rides and each has been exclusively designed for Berjaya Times Square Theme Park. Galaxy Station sees the most visitors on a weekly basis, but is off-limits for those below the age of 13. The attractions include the 800m long Supersonic Odyssey roller coaster (picture below). This custom-made looping ride is the biggest indoor roller coaster in the world and has three inversions: a heart line roll, loop and corkscrew. There are 6 cars per train. 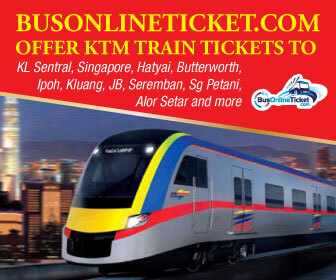 Riders are arranged 2 across in 2 rows for a total of 24 riders per train. The construction took 3 years. Additional rides include the 30m high Spinning Orbit, DNA Mixer, Ooort's Express, Dizzy Izzy, and the swinging Space Attack. Topping it all off is the park�s latest attraction, the Haunted Chamber � this walk-through attraction has actors and special effects to guarantee a goose bump inducing time. Take a leisurely stroll to the magical Fantasy Garden and spend hours of priceless family time with any of the 8 readily available rides. Have the need for speed? Chase or be chased as you & your friends go around the circuit with the Honey Bump. Be sure to buckle up as you�ll be having a bumping good time. Take a ride on one of our Flying Giant Bees & join the sward as they buzz around their nest. Have a buzzing good time enjoying the scenery of Fantasy Garden from a different height. The Fantasy Garden has eight rides for very young children � perfect for families. 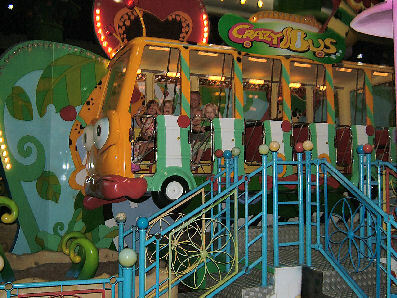 The colourful Garden Avenue is especially popular with toddlers and other fun rides available include the Crazy Bus, Buddy Go Round, Flying Bumble Bee, Botanic Drive, Molly-Cool's Swing, Fantasy Trail, Robo Crash, and Honey Bump. Berjaya Times Square Theme Park also has party rooms for birthdays. Need a quick break from fun? Head on to the Kid�s Theatre to catch a movie or two. Additionally, the theatre seats 180 paxs people and is a great venue to host thematic parties, school trips & even team building sessions. Are you brave enough to take on the rough seas? Feel the wind in your face as you take a swing on Molly-Cool�s Swing and experience a sailor�s life for yourself! Scream your lungs out for a swing of your life. With 14 rides Berjaya Times Square Theme Park is divided into 2 differently themed areas, the Galaxy Station and the Fantasy Garden. Galaxy Station is on the 5th floor and offers rides for adults and children over 13 years of age. Supersonic Odyssey, a custom looping roller coaster by Intamin. It has 3 inversions: a heartline roll, a loop and a corkscrew. Spinning Orbit, a "Spinning Star" ride by Intamin. Space Attack, a pendulum-style ride by Intamin. Haunted Chambers, a walk-through haunted dark ride with live actors and special effects. Fantasy Garden is on the 7th floor and offers leisurely rides of a slow nature. It has colorful Garden Avenue with 8 major fun rides intended for kids and families.